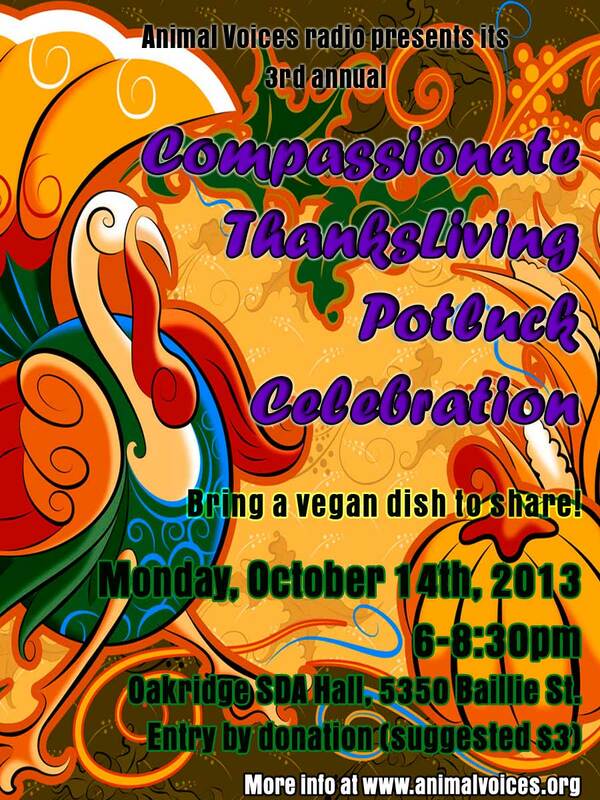 Celebrate a 3nd annual vegan Compassionate ThanksLiving Potluck this year with the Animal Voices radio crew and supporters by partaking in this feast of thanks and bounty. Build community and share delicious nourishment with like-minded people. Socialize with new and old friends over a selection of live musical entertainment. All are welcome to attend! This is an animal-friendly event, so bring a vegan dish with at least 8 servings (no dairy, eggs, honey, gelatin, whey/casein, or other byproducts). Also, please bring a plate, cup, and cutlery for yourself, and a serving utensil for your dish. (a bag for your dirty dishes would be useful, too) If you’re not a cook or are pressed for time, no worries! Sharing store-bought food or a non-alcoholic drink (juice, non-dairy milk, coconut water, etc.) is fine! Please bring an ingredients list for your dish. There will be a ‘raw’ section on the tables, so raw vegan food is encouraged! 140 people attended each of the last two years, and this year we have a wonderful venue that can accommodate up to 200. It is a family-friendly event, so please bring your loved ones! We will have live entertainment throughout the event while you eat! We will have 4 musical performers throughout the evening, who will include: Brittney Grabill, Risa, the band Hello Harmless, and Sinéad. This event will feature a fabulous RAFFLE fundraiser (see list of prizes below!). Please bring some $ for a chance to win some amazing prizes! Tickets will be $1 each or 6 for $5. All proceeds go towards Animal Voices. We suggest a DONATION of $3 at the door (no one turned away for lack of funds). All profits go towards supporting Animal Voices. There is a special entrance for wheelchairs leading from the right side of the parking lot straight into the hall. The accessible washroom (doorway measuring 27″ wide) is located one level up. Don’t hesitate to ask a volunteer for any assistance needed. To rsvp to this event, you can do so here and here. We are excited to have a craft table at our potluck this year! It will be fun activity for kids and adults! At the table you will have the opportunity to make a turkey either using a potato stamp or drawing it on the paper provided. You do not have to be an artist to participate. The turkeys will be submitted to the 46 Million Turkeys project. They are collecting turkeys to honour each of the 46 million turkeys that are killed at thanksgiving every year in the USA. In Canada a further 3 million are killed during this “holiday”. So come by the table and make as many Turkeys as you can! Animal Voices is Vancouver’s only program dedicated solely to animal advocacy and compassionate living. Each week on our show, we focus on various animal rights issues, provide tips on making cruelty-free choices, offer updates on animal related news and events, and interview guests who are at the forefront of animal activism and vegan outreach. Animal Voices is part of Vancouver Co-op Radio, a community supported not-for-profit organization. The show airs every Friday at noon on 100.5fm CFRO (www.coopradio.org) and our blog and all our past shows are available from our website www.AnimalVoices.org.